Discussion in 'ROPH - Ragnarok' started by Sayson, Nov 5, 2018. I figured this method a little bit late but this will help you boost your exp/loots. 1.Finish the 10 daily quests on the board and get X5 exp (called “魔潮” in Chinese) from the NPC in Prontera. You should be able to reach lvl 23 quickly. 2. Yeah it’s time for dungeons. The dungeon during this level is Prontera cracks (“西裂” in Chinese). 3. You need to sole the dungeon for the first time. After that, you can party with other players to get handsome rewards. Note: After finishing 5 times cracks, you’ll get nothing from it and each time the crack’s location may be changed. I would recommend wizard to use fire arrows to one shot willow in the maze/West Gate of Prontera. Tips during this level is the same as lvl 21- lvl25. Actually you can see a lot of lvl30-lvl45 players team up to auto fight here. Healers’ sanctuary skill will cover all the players, just make yourself stand within the spamming area and use AOE. If you cannot see priests there just take the advantage of healing NPC, you can lure groups of mobs to the healing range (inside the door) and use AOE skills. Tips: Apart from cracks, everything is the same as tips for lvl 21- lvl25.During this period, you can try Byalan/Sea Cracks (“海裂” in Chinese). Note: Priest should buff teammate and keep spamming sanctuary before open the crack. During this period, wizard get AOE skills and priest get sp buff. wizard + priest is an ideal choice for endless AOE skill. So I would recommend you to kill steam goblins for coal and bees for crystal. Tips: Apart from cracks, everything is the same as tips for lvl 21- lvl25. During this period, you can try Geffen/Mountain Cracks (“山裂” in Chinese) Note: Priest should buff teammate and keep spamming sanctuary before open the crack. Tips: Everything is the same as lvl 41-45. 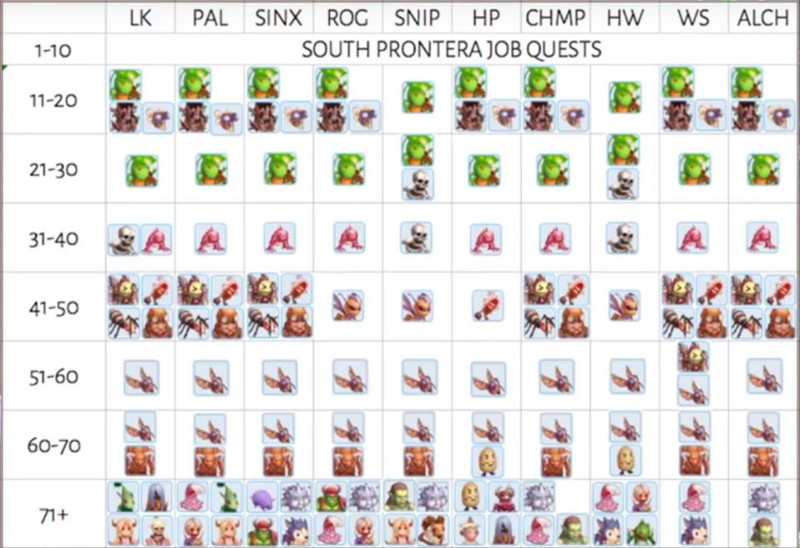 Leveling Map: Morroc & Pyramid & Anthell. During this period, you can try Morroc/Sand Cracks (“沙裂” in Chinese) Note: Priest should buff teammate and keep spamming sanctuary before open the crack. When you reach lvl 52, it’s time for endless tower. You can get op gears in ET, since the MVP there are weaker than those in wildeness. MVP will appear in 10/20//30/…floor. The ET reset at weekly base. Having played Ragnarok Online Mobile for a few days, I’m now a lvl 51 hunter. Many of you are asking how to level up faster, so I am here to bring you my personal leveling guide. Hope you will like it. If you have any question, please comment below. I’ll keep updating this guide. 1. The butterfly can transport you to your reserve point. (You can change the reserve point from Kafra). 2. The flywings can transport you to a random spot in the map, so you had better put it in the shortcut keys, and use it when you’re being attacked by mobs that you cannot deal with. 4. If you’re in a team, click the captain’s icon and then click “ 前往跟随”, you’ll follow the captain automatically to target the same monster. Team up with others will help you to clear your quests quickly. 5. Everyday you can get two X5 EXP quests, the system will keep 3 days’ quests for you which means the maximum for X5 EXP quests is 6 times. Leveling Map: Ghost Ship is still my first choice. Just get Tank, healer, AOE in the team.If you’re tired of Ghost Ship, try Goblin Forest in Geffen. Tips: Everything is the same as lvl 41-45. Leveling Map: Morroc & Sograt Desert. Hey guys, here's a new guide on how to level up your Adventurer Level fast! Check out the link below and you'll rank up in no time! I'm not really grinding on monsters but I do have a daily to do list. I am already level 96 and spend few hours to do important task daily. Check it out if you have time.